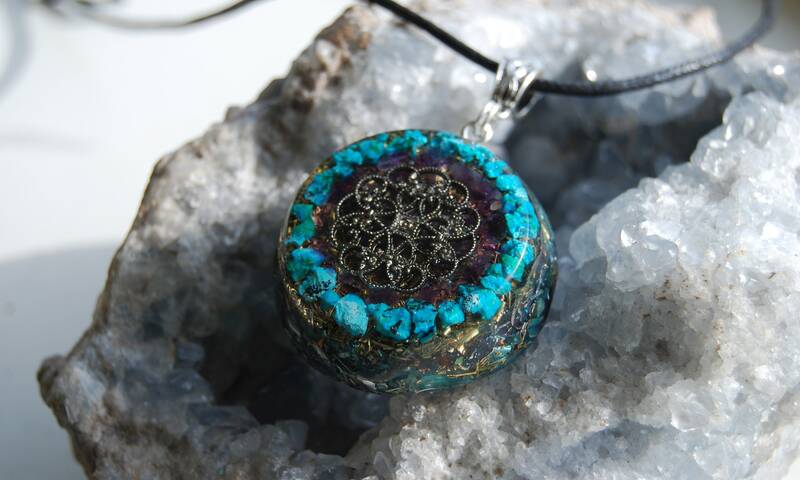 This unique 4 cm / 1.6" in diameter Orgonite® pendant contains copper, brass, bronze and aluminium shavings. 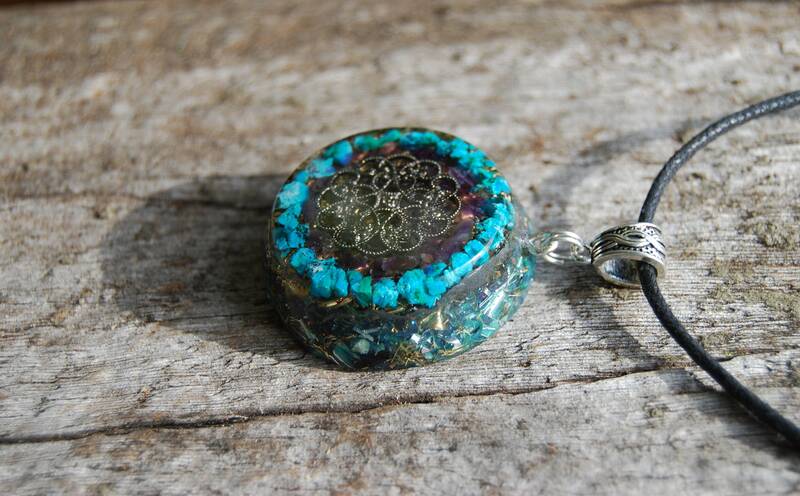 The main stones are raw Chrysocolla (with some Malachite inclusions) and Amethyst in the front. Furthermore it consists Rose quartz (self love), Pyrite (to enhance and deflect extremely low frequencies), black Tourmaline (to protect and ground excess energy), Shungite (protection), Rhodizite crystal (to amplify) and clear quartz (for piezo-electric effect) all within a durable resin setting. 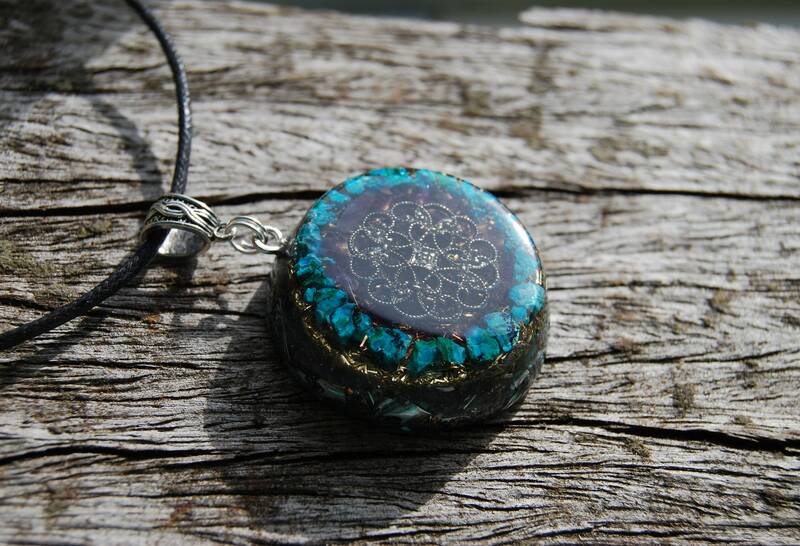 It has a lovely metal decorative symbol (no particular meaning) front all within a durable resin setting. The pendant is made with a lot of metal shavings which is required to properly clean stagnant energy according to William Reich's research. It is the stone of forgiveness, peace, and the strengthening of emotional bonds. It encourages compassion, and helps us recover our natural spontaneity. Chrysocolla supports those who work in the computer industry and accountants by calming emotional stress. For designers and inventors, it encourages inspiration by combining creative ideas with new practical applications. 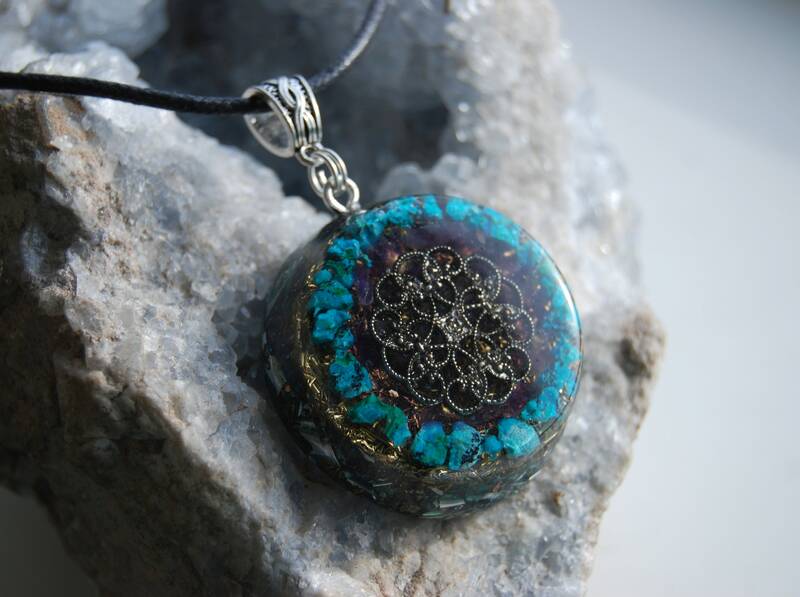 Within the home, Chrysocolla draws off the negative energies of rocky relationships and situations that are constantly changing. It provides stability, acceptance and great inner strength. Chrysocolla is a very supportive energy stone, that will inspire verbal expression, and will empower both men and women to communicate in a clear, loving way. It will open your throat chakra and energize the words you speak, and may help you to choose the right words to speak to aid emotional healing in others. It is powerful to aid truthful and heartfelt loving communication, and was historically used by the American Indian people, to bring a strengthening and calming energy. 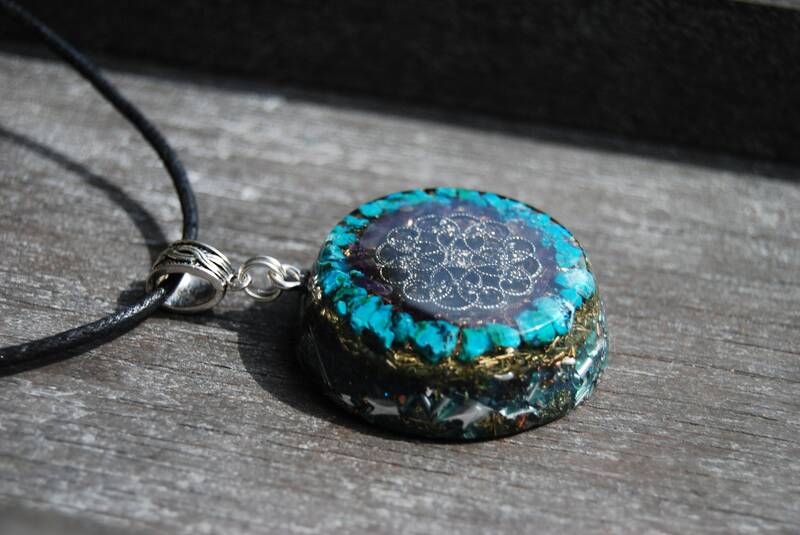 Chrysocolla is a stone of “earth-grounding” and is valuable in preventing one from losing touch with the conscious mind during deep meditations. 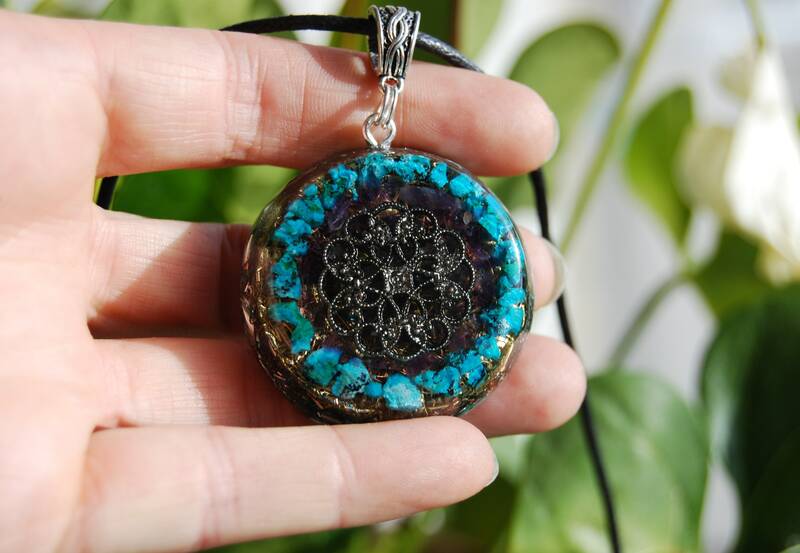 It provides strength and protection during vision quests and astral travel, and due to its high spirituality, acts to improve meditation and to further peace of mind. Amethyst is a natural tranquiliser, it relieves stress and strain, soothes irritability, balances mood swings, dispels anger, rage, fear and anxiety. Alleviates sadness and grief, and dissolves negativity. Amethyst activates spiritual awareness, opens intuition and enhances psychic abilities. It has strong healing and cleansing powers. Amethyst encourages sobriety, having a sobering effect on overindulgence of alcohol, drugs or other addictions. It calms and stimulates the mind, helping you become more focused, enhancing memory and improving motivation. Amethyst assists in remembering and understanding dreams. It relieves insomnia. 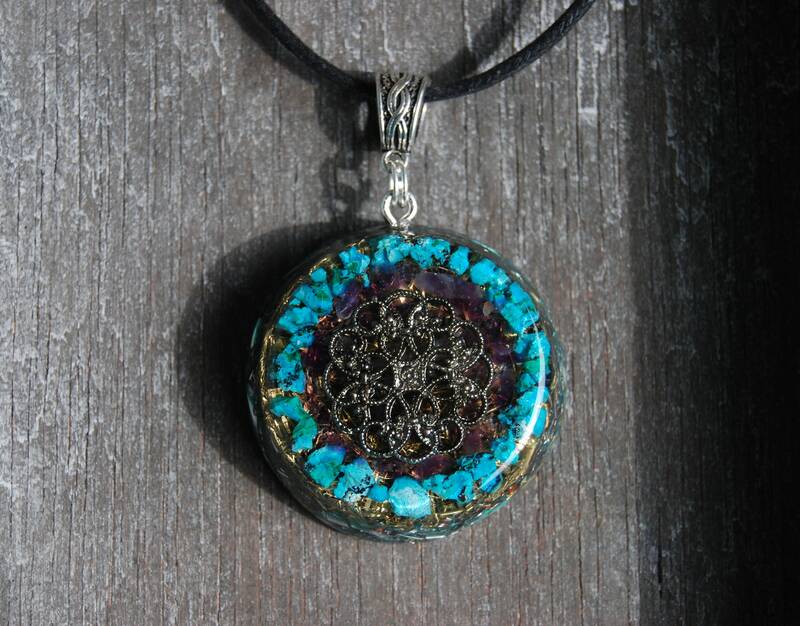 Encourages selflessness and spiritual wisdom. The resemblance of pyrite to gold has made it a traditional symbol for money and good luck. It's sunny golden color associates it with the sun, and with fortification and strengthening of the mind. The name comes from the Greek word meaning "a stone which strikes fire". Iron Pyrite makes a wonderful energy shield, blocking out negativity from various sources. Shungite is a special pure carbon from the region of Carelia in Russia. This charcoal looking mineral has lately become known all over the world because of its amazing healing properties. It is the best grounding mineral of the planet. This amazing mineral is also highly effective to absorb radioactivity and EMF radiation. Its powder is used by the Russian army, to create EMF protective coatings and paints for buildings and aircraft. Today it is used worldwide by geobiologists to balance geopathy and dissipate emotional energy as well. 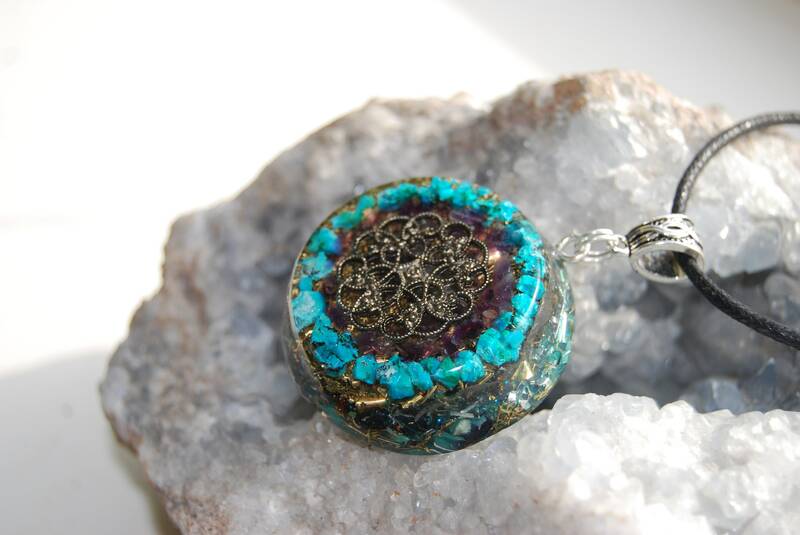 The main function of Orgonite® is to clean stagnant and negative energy. The best ratio is 50/50 resin to metal shavings. The more metal shavings, the better. Orgonite® is a word that was invented by Karl Hans Welz for a material he made as a variation on the technology of Wilhelm Reich. 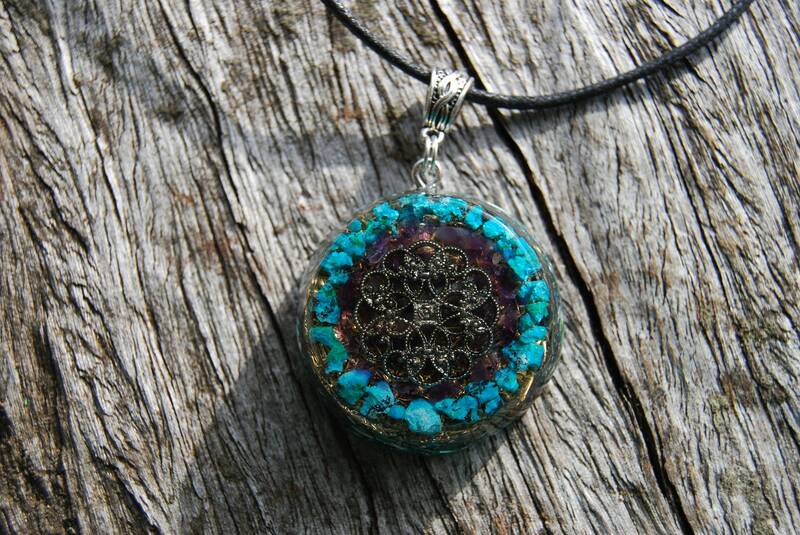 He owns the trade mark for the word Orgonite® and Orgone Generator®. I have been permitted to use the term Orgonite® and Orgone Generator®. 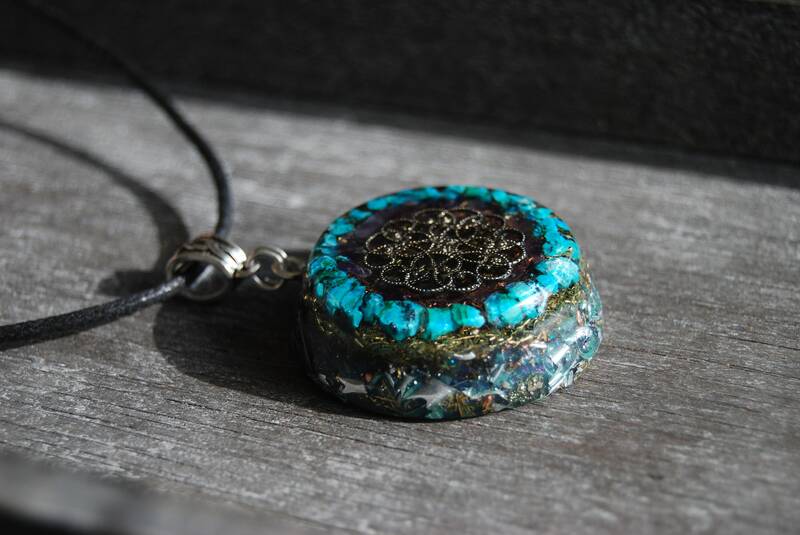 This pendant is created with loving intent to transform people’s lives for the better in a loving environment surrounded by nature. It has been hand sanded through 13 sets of fine polishing paper so it is shiney and silky smooth. Because it is a one of a kind hand-crafted one, it may have slight artistic imperfections. It comes on an adjustable cotton cord.